. 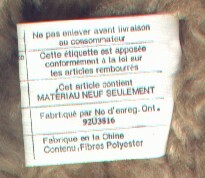 Information on the back of tag is in French.
. Front of Canadian tush tag reads: "Not to be removed until delivered to the consumer. 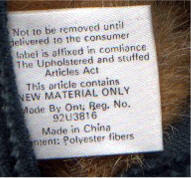 This label is affixed in compliance with the Upholstered and Stuffed Articles Act. 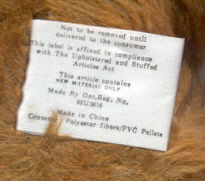 This article contains NEW MATERIAL ONLY. Made By Ont. Reg. No. 92U3816. 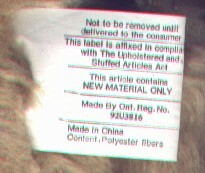 Made in China Content: Polyester fibers. Tush tag shown is from a second generation Benjamin. 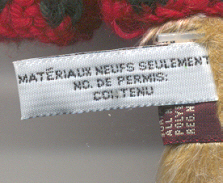 (Silk fabric) Note the placement of "NEW MATERIAL ONLY" as compared to the one above.
. Information on the back of tag is in French. 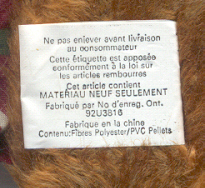 Note the small "o" in the abbreviation of Ontario as compared to the ones above which are capitalized. 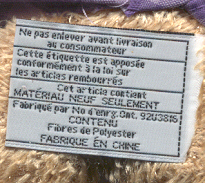 Information on the back of tag is in French. 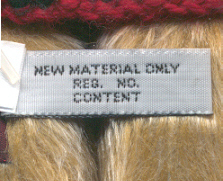 Front of the Canadian tush tag reads: "NEW MATERIAL ONLY REG. NO. CONTENT." Canadian tush tag is from a seventh generation MacKenzie. Note that the registration number and content are missing from the tush tag. 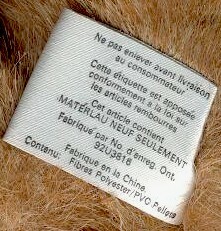 Back of the Canadian tush tag is in French. 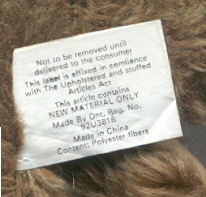 Front of the Canadian tush tag reads: "NEW MATERIAL ONLY REG. NO. CONTENT." Canadian tush tag is from a seventh generation Bearkhardt. Note that the registration number and content are missing from the tush tag. 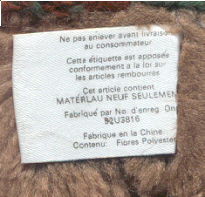 Also notice the placement of the "R" in "Reg.," the "C" in "Content" the placement of the "MAT�RIAUX" in the tush tag above. 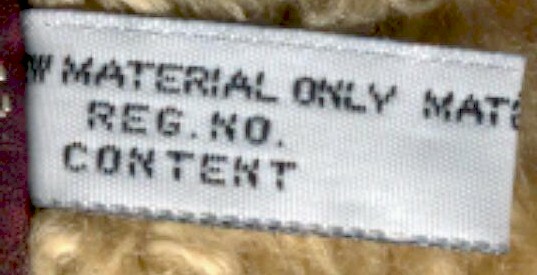 Front of the temporary tush tag that reads: NEW MATERIAL ONLY REG.NO. 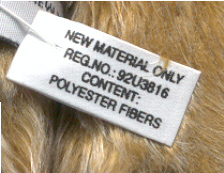 :92U3816 CONTENT: POLYESTER FIBERS. 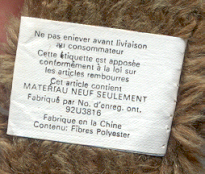 Tag shown is from a seventh generation MacKenzie. 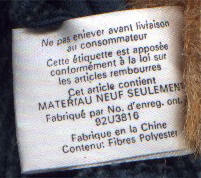 Back of the temporary tush tag is is French. 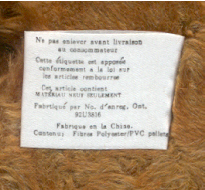 Front of the Canadian tag reads "New Material Only Reg. No. 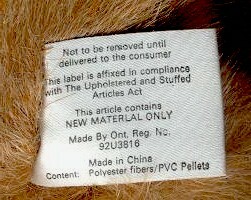 92U3816 Content: Polyester Fibres. 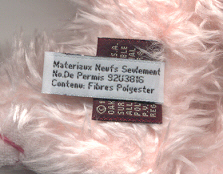 Tag shown is from a seventh generation Blush. 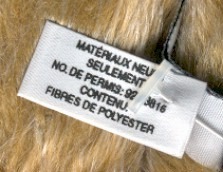 Front of the Canadian tag reads "New Material Only Reg. No. 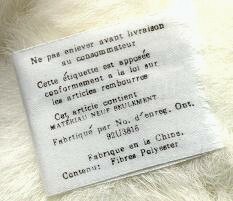 92U3816 Content: Polyester Fibres. Tag shown is from a seventh generation Sophia. 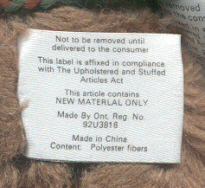 Front of the Canadian tag reads "Not to be removed until Delivered to the consumer. 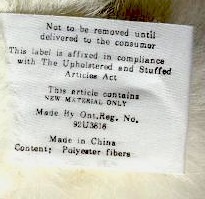 This label is affixed in compliance With the Upholstered and Stuffed Articles Act. 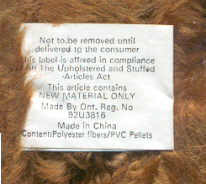 This article contains NEW MATERIAL ONLY. 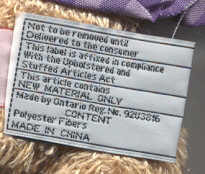 Made by Ontario Reg.No. 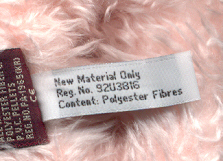 92U3816 CONTENT Polyester Fibers MADE IN CHINA. Tag shown is from a seventh generation Mommy.